When I saw this necklace I fell in love!!! Simple but wowzas! I knew I could wear it so many ways - work and play! However the price wasn't jiving. So what does a girl do.....make sure she gets what she wants that's what!!! I had some of the supplies on hand while others I ordered. Et Volia!!! I'm in love! What you'll need: Chain, jump rings, clasp, crystals, and jewelry pliers. You will use the jump rings to attach you clasp, and crystals. I used 2 jump rings connected together to use as link for the clasp to connect to - my clasp wasn't large enough to go around the chain I had selected. I made one with three crystals and one with five. I love them!!!! What do you think? Would you like to see some in my Etsy store? Cannot wait to make this!! Great DIY - may I ask where you found that chain? super cute! where did you find the chain and crystals? This is absolutely adorable!! I will have to try this - such a steal. You did a fabulous job. I love it! Simple and gorgeous. Simple and chic! 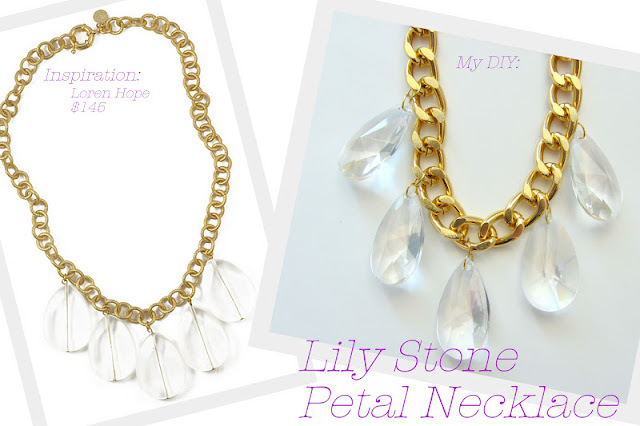 Love how each crystal packs such a punch...great to layer with simple tees for summer! Great tutorial! Pinning! So pretty -- I love the chic, decadent look. I'm in awe of you DIY masters! So gorgeous! That necklace looks great! Where did you pick up the gold chain?